A piece with two voices, the treble and the bass (the treble being divided sometimes) that sounds very well with a string ensemble. Because of it is only for unique parts, a precise work and the musical style with the bow, the tuning, the dynamics and the musical style can be established with the group. With an energetic character, the composition presents mainly imitation with the cellos and double bass answering the violins; when it is not the case, they answer the bass. 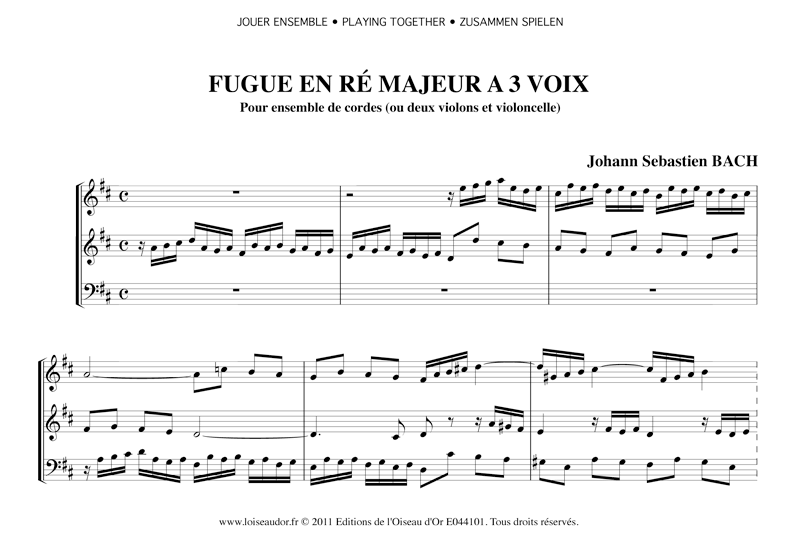 Of course, a version for violin and cello duet is possible. Cf. also in the same collection to the "Bourree" of G.F. Händel that offers the same possibilities with a easier level. 8 pages : the download includes the score (2 pages) and two separated parts for the violins (4 pages) with one for the cello and one for the double bass (2 pages).